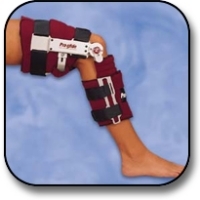 Addresses joint stiffness of the knee by using a low load, prolonged stretch modality. It features a combination flexion and extension in one unit. This patient compliant lower-extremity orthosis has a rigid lightweight aluminum frame that allows easy alignment of the hinge joint with the patient\'s knee axis. The precision gear-hinge system provides smooth tension control with the simple turning of the adjustment mechanism. The Pro-Lock EZ Application System enables the patient to remove and re-apply the Pro-Glide with out reducing the tension setting. The machine washable liners are designed with soft breathable materials for maximum patient comfort. Weight: Less than 2 lbs. Replacement softgood kit available. Indications: Joint stiffness of the knee.